Tonight I unpacked my golf bag from last week’s Scotland trip. Honestly, I have no desire to play “American” golf right now. But duty calls, a charity golf tournament tomorrow morning. So I had to get my bag ready. Part of getting ready is installing my new Kingsbarns Golf Links putter cover. Brilliant! 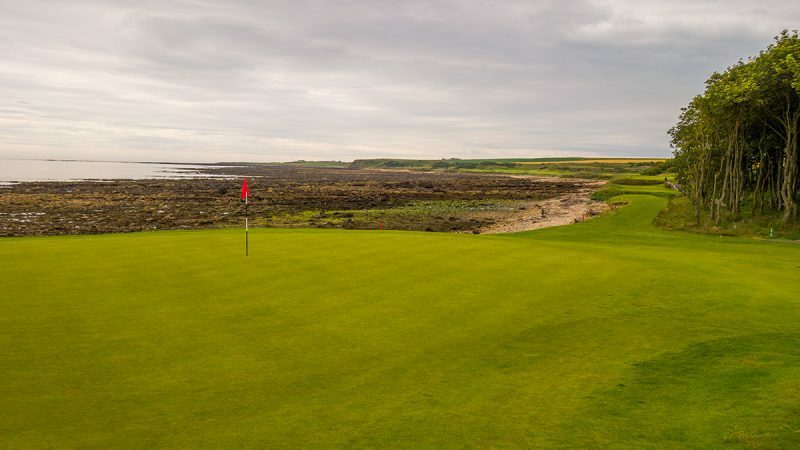 Speaking of Kingsbarns… This past Sunday morning the HOG World Tour and my friends “The Lads” spent a fantastic 18 holes on Kingsbarns Golf Links. Kingsbarns is one of the best courses I’ve ever played. Easily in my top five and I’ve played many of the world’s best. The course design combined with the views of the sea are tremendous. 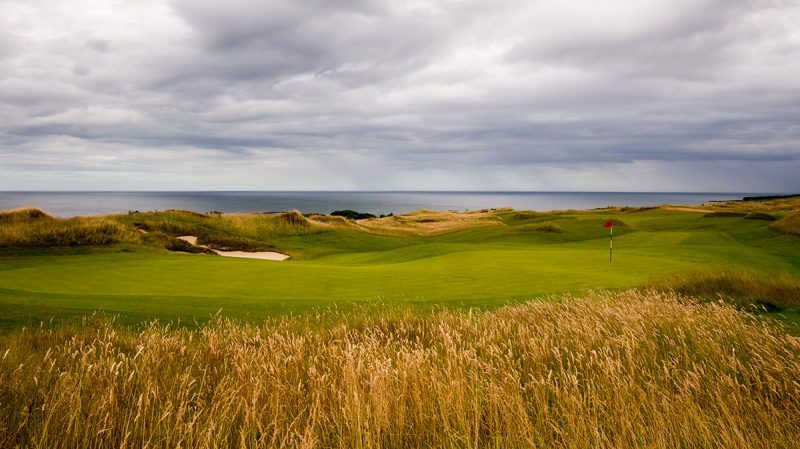 Kingsbarns is a must-play for any golfers who are in St. Andrews. It’s just a few minutes away. Below The Lads (and Lorna the Lass) are enjoying post round wee pints and some fantastic Kingsbarns food for lunch. My favorite is the chili. Cheers to my friends at Kingsbarns and special thanks to Alan Hogg, a fantastic host. For more, check out my Kingsbarns Golf Links review. Tomorrow morning I’m going to hit a golf ball for the first time since Scotland. I’m playing with my dad and two uncles in a Greek charity golf tournament. A scramble. Hit and giggle. 7:00a.m. on a Saturday! At least I’ll have a new putter cover from Kingsbarns Golf Links to play with in my half brain dead state. 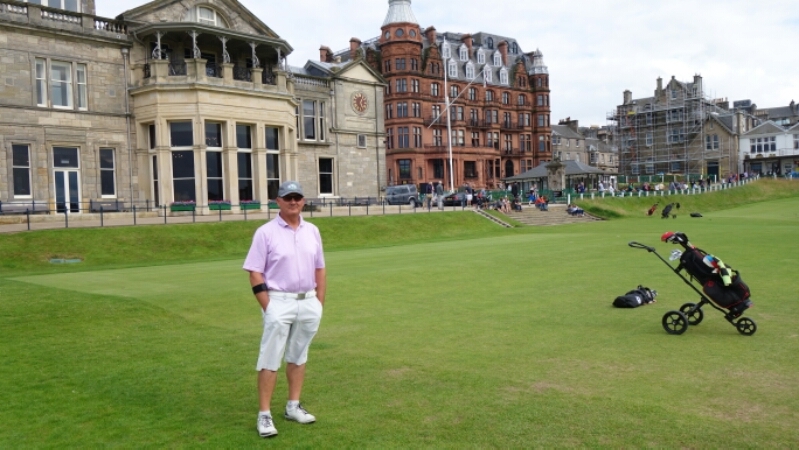 Day three of the tour in Scotland was one of the two 18-hole days. The others being all 36-hole days. The reason for only 18 on this occasion is due to the travel time required to get from up north in Cruden Bay down to St Andrews. While we could have played the renowned Carnoustie Golf Links a few hundred yards away, the Lads (our golf buddy group) decided to try a course we had not played before, Panmure Golf Club’s Barry Links. The Carnoustie area was chosen as it was on the way from Cruden Bay to St Andrews. Panmure (1845) is a historic private club, one of the oldest in the world. 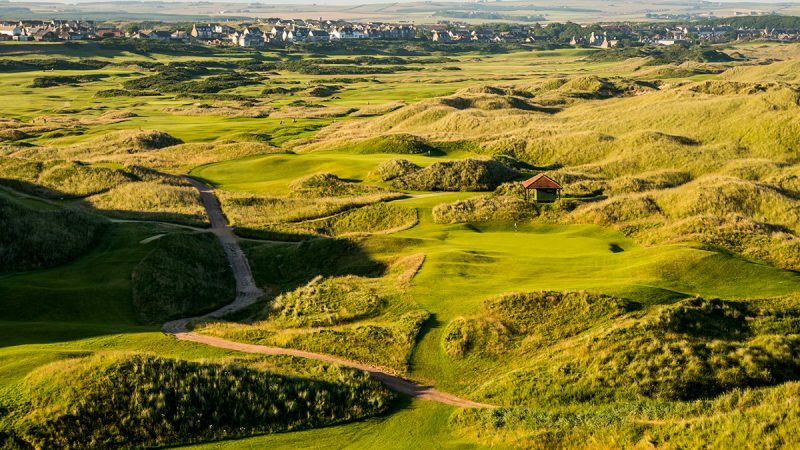 The club plays over the Barry Links, a course so old that the course designer is unknown. The course oozes history, tradition, and old-school class. The clubhouse has probably been the same for 100 years. The course certainly has. 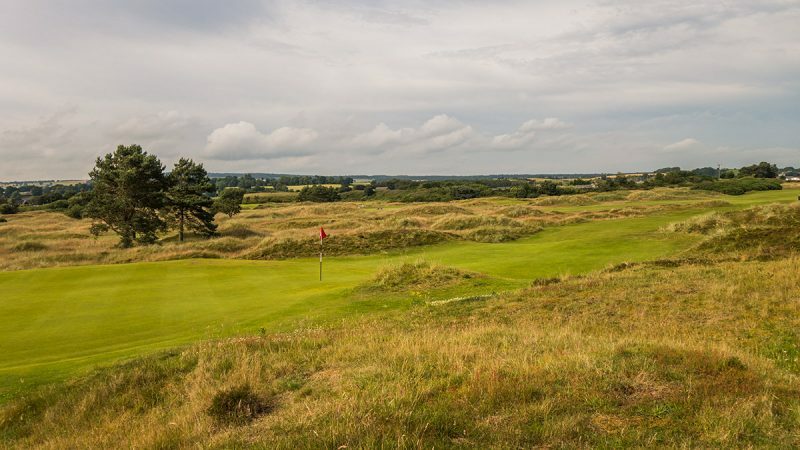 Panmure is known as being the course Ben Hogan chose to practice at when he was competing in his only Open Championship (USA translation: British Open) at Carnoustie in 1953. The course plays similar to Carnoustie and Hogan liked privacy. It is said that Hogan wanted the 17th hole to be modified to be more similar to Carnoustie, suggesting the green be cut shorter. The head greenkeeper gave Hogan a mower. Hogan cut the grass himself and cleaned the mower before returning it. Panmure is a joy to experience from a pure golf standpoint. The holes are soft on the eye visually and feature many wide fairways, dunes, and unique green complexes. Errant shots can be severely penalized however, by long “barry rough,” deep bunkers and dunes. Despite being a short course at about 6,500 yards, scores at Panmure as an Open Championship qualifying venue, have been the highest. My personal experience at Panmure was difficult unfortunately. Due to many technical issues I was not able to fully enjoy and soak in the experience and vibe. First, oddly, was that the weather was too good. Yes that sounds odd I’m sure. It had rained all morning right up to our 2:ooPM tee time. Right at 2:oo the clouds parted and the rain stopped. The sun started pounding on the course, and us golfers. Club rules do not allow shorts so I was playing in trousers (known as pants in the USA). I don’t normally wear trousers because of heat issues. The combination of the unusually warm temperature, the trousers, and nearly 100% humidity caused me to sweat profusely. The sweat led to physical discomfort, dehydration, and frustration due to not being able to grip the club with slippery hands. My half Greek half Scottish sweat was like an all-you-can-eat buffet for the flies. I was being attacked. If the heat and sweat issues weren’t enough, I had some serious foot problems. I had to tape a couple of toes and my right heel by the back nine. I was wearing some new inserts for my feet to give me more arch support. After about five miles of walking in them that day I was hurting from the blisters and general aching from the hard supports in the inserts. I’ve never actually done it, but I nearly walked off the course between the sweat and the feet. It was a shame to have my focus taken away from the course and its beautiful walk, but I did the best I could to absorb it. Panmure seems to be a golf course and club that is frozen in time. It’s one of the purest and most unique experiences I’ve had despite my physical struggles. I hope Panmure never changes. I’ve been playing 36 a day here in Scotland for what feels like weeks. My connectivity and time to post has been very limited to. I will be posting many pictures and comments soon when possible.